Merlin Way residents - (Front row left-right) Charlie Donley, Jack Donley,(Beck left-right) Velda Donley, Jonathan Brash and Rob Kendon. 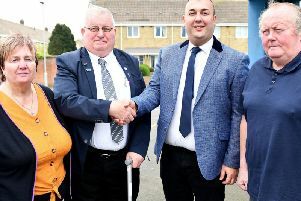 Residents on a Hartlepool housing estate have launched a petition calling on developers and council bosses to act now over a ‘deathtrap’ road. The Bishop Cuthbert and Clavering Residents Association have launched a petition for a safe crossing to be put in place on busy Merlin Way close to the shopping parade off the A179. Developers have agreed to install a crossing as part of 500 new homes on an area known as Upper Warren. But the residents say the crossing needs to be installed now due to the speed and level of vehicles using the road and because permissions have been granted for a 90-bed care home and new pharmacy in the vicinity. A spokesperson for the residents group said: “Children have to cross that busy road to access another busy road to get to Clavering school. “Merlin Way is a deathtrap. There have been numerous instances along the road where vehicles have been speeding or lost control. “We are witnessing mothers with babies in pushchairs and with toddlers crossing that road at busy times. “It’s a busy part of the estate because of the pub, shop and cash machine. The residents association has collected around 500 names so far on paper petitions and also online at change.org. They plan to present it to Hartlepool council leader Councillor Christopher Akers-Belcher. Developer Persimmon says it will provide a toucan crossing sooner than originally planned as part of the 500 new homes. But Rob Kendon, chairman of Bishop Cuthbert and Clavering Residents Association, said it could be several months before final planning permission is signed off by the council. He added: “I think until we get a specific date from either the council or Persimmon I don’t see any reason why the council couldn’t or shouldn’t pay to put that crossing in. A spokesman for Persimmon Homes Teesside said: “We have been in discussions with Hartlepool Borough Council as part of our ongoing Reversed Matters application. A Hartlepool Borough Council spokesperson said: “The funding and building of the crossing by Persimmon is an integral condition which we have required as part of Persimmon’s planning application.